COLUMBIA, Ky. — Marygrove men’s soccer opened the 2015 season Wednesday (Aug. 19) facing the NAIA’s No. 9 team, Lindsey Wilson (Ky.), without several projected starters. The shorthanded Mustangs allowed a goal in the 3rd minute before settling in to tie the game late, sending the season-opening tilt to overtime where the host Blue Raiders eventually prevailed, 2-1. Momentum was seized by the Blue Raiders (1-0-0) in the 3rd minute when a set-piece ball bounced around the box inside the near post past keeper Austin Valentine (Westland, Mich./Concordia-Ann Arbor). The Mustangs shook off the early goal and settled in to a well-played first half to go into the break down, 1-0. Sophomore forward Curtis Tiapocket (Nanterre, France/Wayne County Community College) had the lone shot on target for the Mustangs (0-1-0) in the opening half, a strike in the 24th minute that would make the Blue Raiders keeper work left for a quality save. 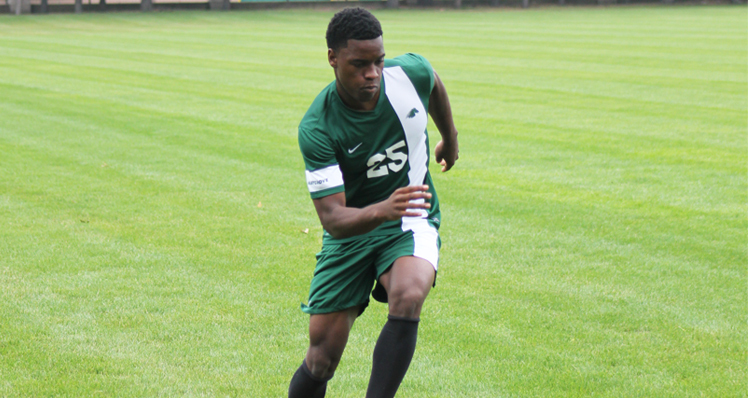 The Mustangs’ Gbenga Ayanwale (Osun State, Nigeria/Atanda International) notched the equalizer in the 83rdÂ minute from the left side of the box after a well-timed pass from returning All-WHAC performer Abdoulie Jallow (Bansang, The Gambia/Rust College) set up the play for his 22nd career assist. Ayanwale’s goal â coming in his collegiate debut â sent the game to golden-goal overtime where the Blue Raiders’ Aleksi Pahkasalo toed a well-struck ball upper-90 to lift the hosts to a 2-1 victory over the Mustangs after a hard-fought 95 minutes of action. Valentine enjoyed a fine Marygrove debut after turning away four Blue Raider shots behind a makeshift Mustang defense that was up to the task. The Blue Raiders outshot the Mustangs on target, 6-2, over the course of the 95-minute affair. The Mustangs entered the season-opener without several projected starters and key role players as Mohamed Alkhulaidi, Haider Alzayadi, Gonzalo Caceres, Ali El Habhab, Moussa Diallo and Ayman Youssef all sat Wednesday’s contest. The aforementioned group entered the 2015 season with a combined 148 career starts at the collegiate level. The Mustangs will host Bethel (Ind.) on Saturday (Aug. 22) to open the home portion of their 2015 slate at 5 p.m. The Mustang Sports Network will debut its men’s soccer coverage at 4:45 p.m. on marygrovemustangs.com/live with Jeremy Otto and Brendan Johnson on the call. Note: game time and broadcast start time subject to change.